Are they as good as they claim to be? The first thing we notice about these machines is their looks. They look pretty good, don't they. They are tall and slender. We wouldn't mind having one of these in the living room. Much better than those big, boxy air cleaners from other companies. This is why these air purifiers are so popular. They just look so darn good. How many times do we buy something just because it looks good? This is a BAD reason to buy an air purifier. Well, do the Ionic Pro air cleaners work or no? Ionic Pro air purifiers are based on ionizing technology. You can read more about ionizers here. In short, ionizers charge particles in the air. The charged particles will then stick to each other and fall from the air to the floor. They also will stick to walls or in this case the collector plates inside the air purifier. You have to regularly clean the collector plates. Air first crosses wires that emit an electric charge. This creates ions in the air. The air is then pulled to oppositely charged collector plates. The pollutants in the air stick to these plates. They stay there until you clean them. These charged ions also are released into the surrounding air. They travel around your house. They make particles stick to each other and fall out of the air or stick to the walls. We have said it before and we will say it again. We like this technology. We think there is definitely a place for ionizers. We like them combined with a HEPA filter. This makes a very effective air purifier. 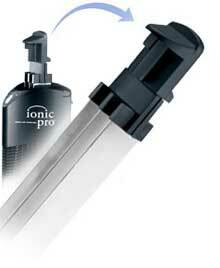 On the Ionic Pro website they say that this will remove particles as small as 1 micron. When we read this we were amazed. This is not good at all. Many people will think this is great. Consider that a HEPA filter will remove particle down to 0.3 microns. 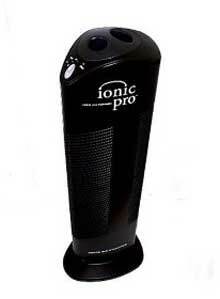 Ionic Pro air purifiers are lightweight and portable. They only weigh 10 pounds so they are very easy to move around. They claim to have a coverage of 500 square feet. We think that this is ridiculous. In our opinion there is no way that this air purifier can cover that much area. We assume it is listed as this big because ions can drift that far away. They don't use much energy at all. In fact, you could use this 24/7 and not see much change in your monthly electric bill. These have a 30 day free trial and come with a 1 year limited warranty. The biggest advantage is they have a permanent filter. You will never have to buy a replacement filter. You will have to clean the collector plates every 2 - 3 days. The wires will have to be cleaned every 8 - 10 days. Both of these are easy to do. The top pops off and you can pull out the collector plates. Use a toothbrush and water to clean them. You need to make sure they are completely dry before you put them back in. It can take up to one day for them to dry. This is why some people will buy an extra set of collector plates. To clean the wires pull the handle up and down a couple of times. There is also a Turbo model available. This is like the bigger brother of Ionic Pro air purifiers. It uses the same basic technology. It adds a germicidal chamber. This is to kill germs, bacteria, and other organisms. The best way to kill germs is with UV light. This is very effective. But to work the air purifier has to pull air into it. Without a fan this is very hard to do. This has an Oxygen Plus filter that turn ozone and smog into oxygen. We think this is a good idea, if it works as advertised. These are just smaller versions of the larger purifiers. They work exactly the same way. How do Ionic Pro Air Purifiers Do? We don't think it does very well at all. There are a couple of problems we have with it. It has no fan. When the air is charged it does move toward the collector plates. This causes some air circulation. In fact, you can feel a faint breeze from it. (maybe this is way Ionic Breeze named there machine "Breeze") But it is not enough air circulation to be effective. There is no fan to pull more dirty air into it. In the word of David Oreck "You have to move the air, to clean the air." I don't think ,a href="https://www.all-about-air-purifiers.com/oreck-air-purifiers.html"> Oreck air purifiers do a much better job, but I do like this statement. Ionic Pro air purifiers only removes particle 1 micron and bigger. Sure this covers some allergens. You will have to remember that the smaller the particles are they worse they are. This purifier only gets the big particles. So even if this purifier works as advertised, it still DOES NOT remove the most aggravating particles. You will still be breathing in all the dangerous pollutants. These air purifiers, like many ionizer will probably release ozone. The turbo has a special filter to convert ozone into harmless oxygen, but the Pro doesn't. We don't like any air purifier that releases ozone. Ozone is an lung irritant and can cause more problems than the allergens did. It is hard to find objective reviews because of the amount of marketing hype out there. It's a good strategy. Flood the market with hype and everyone will believe it. There are some positive reviews of Ionic Pro air purifiers we found. They stated that dust was lower in their house and they could breathe easier. They could not tell a difference in the air with the machine on or off. The indicator lights keep lighting up after cleaning the plates. Customer service is not very good. If you couldn't guess, we don't like Ionic Pro air purifiers. We feel that they do not perform well and potentially release harmful ozone into the air. You can find an air purifier that will do a much better job. It may cost you a little more money, but remember with air purifier you get what you pay for. Leave Ionic Pro Air Purifiers Page and Return to All About Air Purifiers Home Page.